Proceedings: For individual presentations see the program. The full report can be ordered from listings of conference and meetings proceedings on EUMETSAT's homepage; reference EUM P.40, ISBN: 92-9110-057-9. 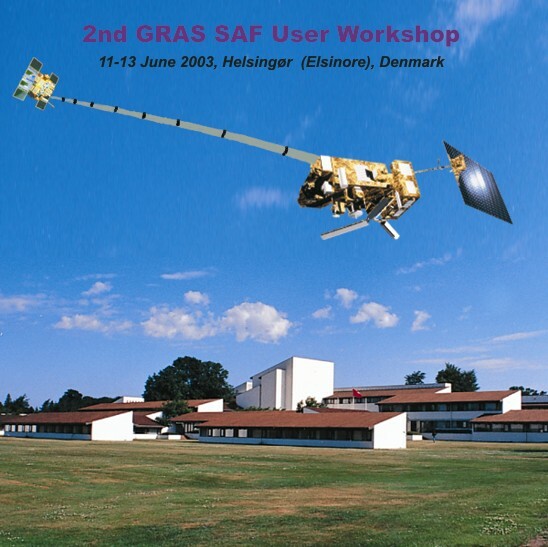 The 2nd GRAS SAF User Workshop was held in Helsingør (Elsinore; close to Copenhagen), Denmark on 11-13 June 2003. The aim of the workshop was to gather future potential users of radio occultation products from the GRAS SAF in order to discuss user needs and make sure that GRAS SAF developments take account of the users' requirements as a follow-on to the recent GRAS SAF User Questionnaire. Software to assist in assimilating these data into NWP systems. The targeted users are National Meteorological Services (in particular their NWP centres), other atmospheric data assimilation centres, climate monitoring centres, and research groups. The workshop comprised a general introduction to the radio occultation method, detailed presentations of the planned GRAS SAF meteorological products and NWP assimilation software, and a description of the ground segment of the GRAS SAF for EPS/Metop data as well as radio occultation products from other satellite missions. The meeting was attended by the GRAS SAF Project Team, representatives from the GRAS SAF Steering Group and EUMETSAT, plus approximately 20 invited guests from different meteorological services and research groups.